Once again, I'm participating in Sew Mama Sew's Give-away Day! This is such fun!! Come back on May 6 -May 10 and enter, then hop back to Sew Mama's blog and enter a bunch more!!! I'll be giving away something handmade just in time for Mother's Day. 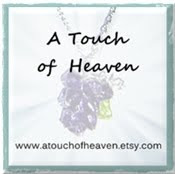 You can take a look at some of my handmade products at my Etsy store, but the item/s I'll be giving away aren't there. I'll be giving something brand new and never posted on Etsy. I hope you come back and enter!